A Shoe Lover + Minimal Closet Space = FRUSTRATION & SHOE CLUTTER! Thanks to good ole Pinterest (WARNING: This site is addictive! Don’t say I didn’t warn ya!) I found a great shoe storage option. Convert an old bookcase into a shoe storage unit. This is such an awesome idea for people who have lots of shoes, with limited closet space like myself. I had an old cheap bookcase that I was planning to rid of, but instead I got rid of all of those containers and moved the bookcase upstairs against my bedroom wall. This freed up soooo much space! 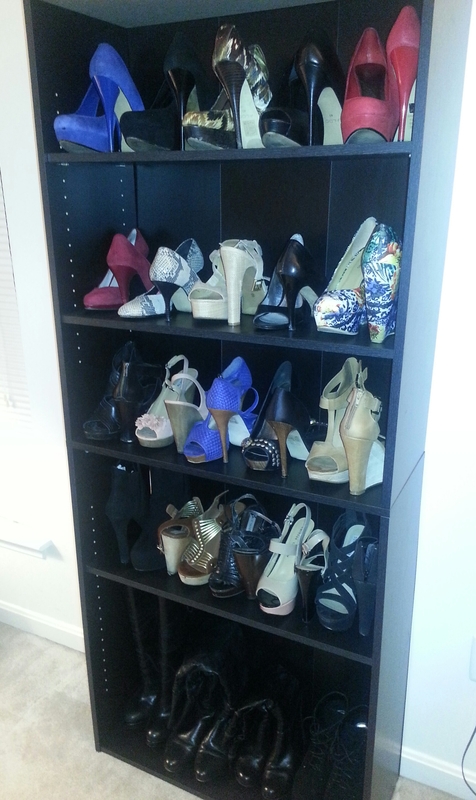 I have approximately 28 pairs of shoes stored on the bookcase (top row of shoes not visible in the pic). Each shelf holds about 5 pairs of shoes. They are extremely easy to access and it looks so much better than my old plastic container shoe wall. Although I wasn’t able to store all of my shoes, I was able to store some of my favorites on the shelf. The ones that didn’t make it on the shelf are stored in containers in the garage. I still have plenty of space on the bookcase, so I plan to add 1-2 additional shelves to make room for this winter’s newbies! My shoe lovers out there, how do you store your shoes? « I’m Not A Model, But I’m Dope! Right now I have an over the door shoe holder…but I like your idea. I may try it when I move to a bigger place. Sounds good! It’s very convenient when you don’t have a lot of closet space. I plan to add more shelves so that I can store more shoes on it. Yeah, I’ve had to find creative ways to create more space in my tiny apartment lol. Did this for my Mom over the Thanksgiving holiday! Being in the education profession she had bookcases she wanted to throw away. My fiancé went to Home Depot and purchased plywood for the back and she is enjoying her new shoe cases! Thanks again! Yes! The bookcase idea has been a life saver for me!